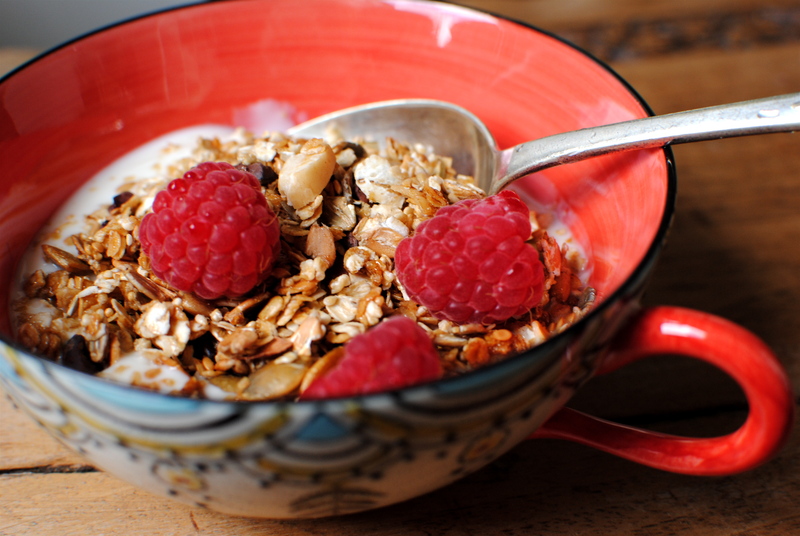 Hands up, who likes granola? Excellent, that’s most of you. But did you know that some of the granola we eat should really be re-classified as dessert? Despite its rather saintly image, most granolas are quite high in both sugar and fat. And we tend to eat rather more than the suggested serving size. Unless I weigh it out, I know I can certainly tip in quite the little mound. And no, not even the fact that it may float innocently in unsweetened soya milk and be topped with decidedly healthy fresh berries makes it a super-healthy breakfast choice. If granola were a person I believe it would be batting its lashes coquettishly before leading us very astray. So, does this mean you should relegate your favourite granola to the status of treat? Or, perhaps, just try an easy, no-brainer recipe instead? To help you make up your mind I have had a wee look at some popular UK brands, as well as a read of an interesting article that appeared in the Daily Mail newspaper. Despite knowing that commercial granolas are certainly not for dieters, I was quite taken aback by how ‘dessert-like’ are many of the brands – good, trusted brands. That’s not to say we should not have them. They aren’t evil or bad for us, just not what we think they are. 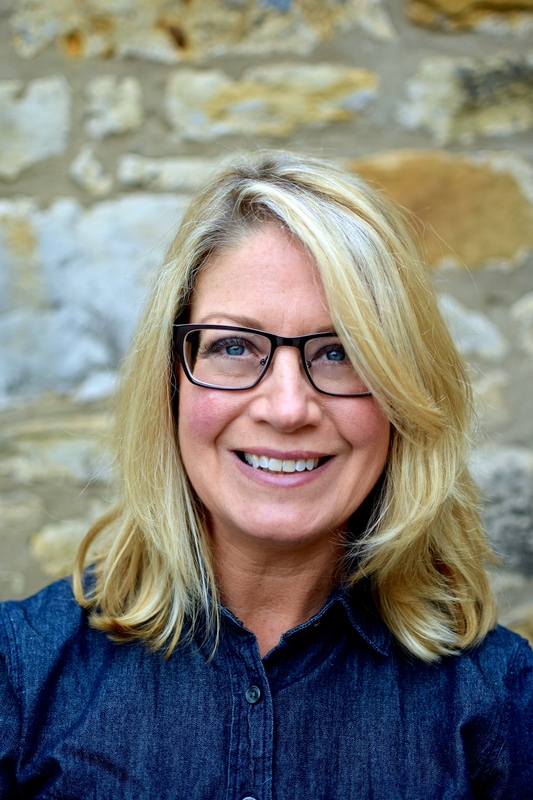 A check on the labels of a half-dozen well-known UK granola brands by dietitian Anna Raymond showed that all had more than 12.5g of sugar per 100g. This is the threshold that denotes a high-sugar food. As UK health guidelines recommend consuming not more than 90g of sugar a day, that’s quite a lot of extra sugar that we might not account for. Cereals at the lower end for sugar (Honey Granola by Dorset Cereals) tended to be higher in fat (lots of nuts), and vice versa. Pretty much all were over 400 calories per 100g – without milk. That’s almost fine if we keep to proper serving sizes, but the problem is that a serving is usually just a couple of tablespoons – about 1/4 cup. I know, bummer. 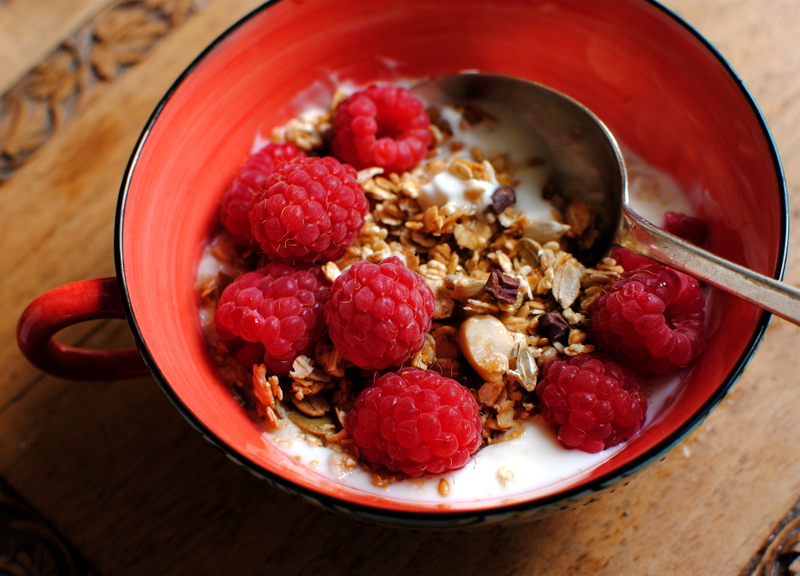 Serving size advice varies according to what you read and what’s in the granola. You can look at the article here. She makes some rather odd comparisons with coffee chain muffins, cola and fast food, perhaps forgetting that all of the granolas, despite their ‘faults’, have good amounts of soluble and insoluble fibre, minerals and vitamins. Even still, I really think we are better off mainly making our own. You all in the US might want to read this article (from 2008, so brands may be out of date) as it lists popular brands and how they stack up nutritionally. 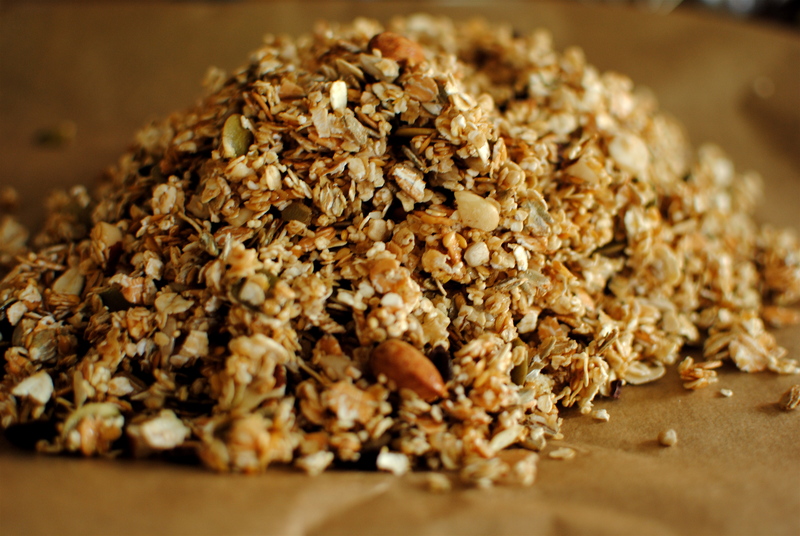 As might be expected, there are quite a lot of good recipes for granola on the internet. I have tried a few and sometimes make my own riff on a Nigella one that she borrowed from someone else. I do however eschew the not-uncharacteristic-for-Nigella addition of extra honey dribbled over. A bit of gilding the lily, but very Nigella. Many of my recipes – including this granola one – have been honed over the years to what we like as a family and as new ingredients – and information – become available. Tastes change too: Miss R now likes for me to throw in the occasional esoteric ingredient – cacao nibs was a recent add-in for the granola (I wasn’t keen on it). I would say this is a fairly conventional take on granola, but the addition of amaranth or quinoa ‘souffle’ (puffs) adds more satisfying protein. More protein = more satisfaction. 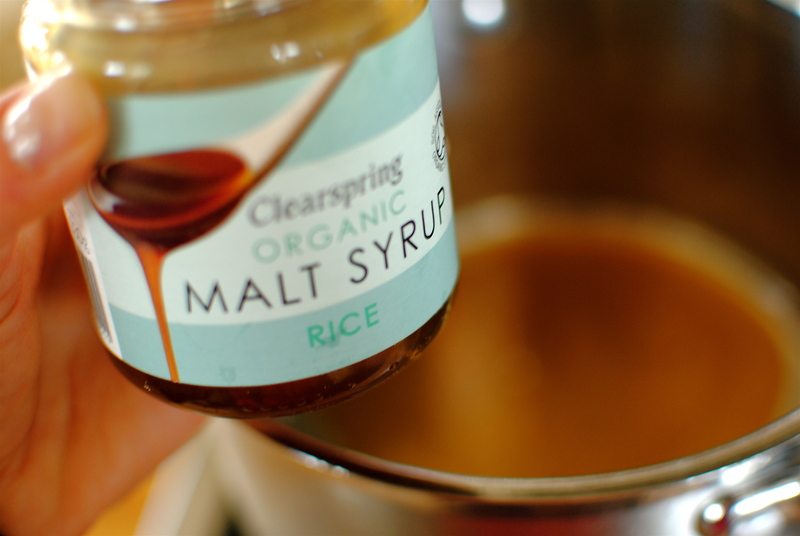 And the malt syrup, although a sugar, does have quite useful nutrients that we could all use more of. And it tastes amazing and, well, malty. 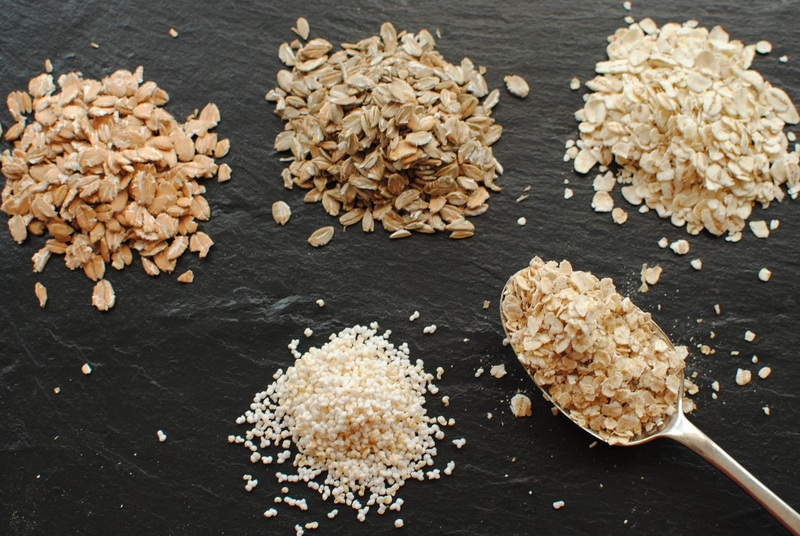 Nutrition Notes: Oats are rather ubiquitous grains, appearing in breads, cookies, savoury biscuits, as flour and, of course, at many breakfast tables as muesli or granola. You can even pop a couple of tablespoons of porridge oats in a smoothie to power it up. But their ubiquity shouldn’t detract from their rather elite nutritional usefulness. Known scientifically as Avena sativa, oats are especially hardy crops, growing in soil where little else thrives. That reminds me, we (I include myself here) can sometimes be so enthralled by the latest hype about obscure ingredients that we forget about the good stuff already in our supermarket trolley or CSA box. I bet you already eat things such as apples, prunes, walnuts, citrus, garlic, dark green vegetables and olive oil. These are every bit as healthy and worthy as acai berries, wheatgrass and chia seeds. And vastly less expensive too. Eating healthily doesn’t have to be second mortgage territory. As I am typing this I have just looked at a recent article that supports what I have just written. Have a look here for a longer read on this, and definitely more skilled writing. 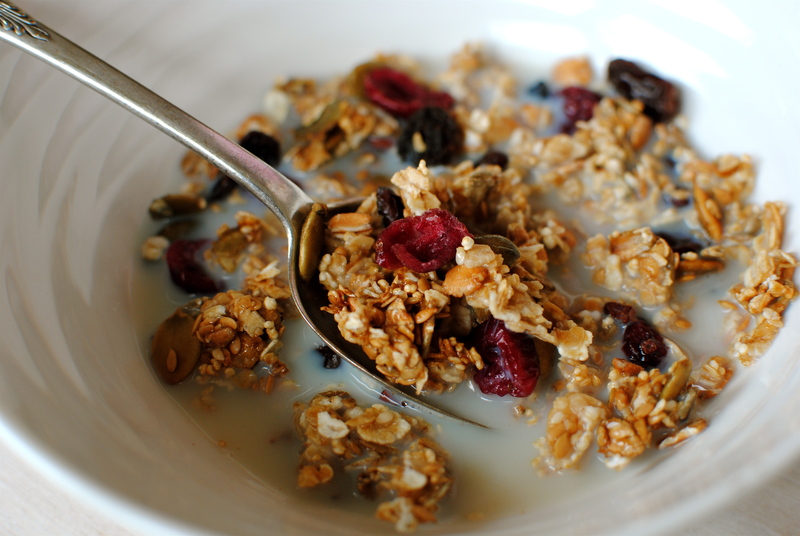 Granola is quite fattening, despite its healthy image (people get it mixed up with the more virtuous muesli). Here I’ve given it a makeover that cuts down drastically on the added fat but is extremely tasty. Homemade granola is still a source of fat because of the nuts, but when portion-controlled the good definitely outweighs any bad. It is also incredibly simple to make and you can customise it to your heart’s content. Buy the best quality ingredients that you can get as it really makes a difference, especially with the dried fruit. Preheat the oven to 140C (fan 130/gas 1). Heat the oil, liquid sweetnener of choice, and muscovado sugar in a large pan over a gentle heat until very runny (heating of the liquids is necessary to properly coat the other ingredients). Take off the heat and add all the remaining ingredients except the dried fruit. Stir and mix until evenly coated. Spread the mixture on two baking sheets lined with non-stick baking paper. Bake in the oven for between 30 and 40 minutes (depends on your oven – mine’s fast), stirring frequently, until crisp and light golden brown. Cool on the sheets for five minutes then tip into a large bowl and mix in the fruit. Decant into an airtight container. 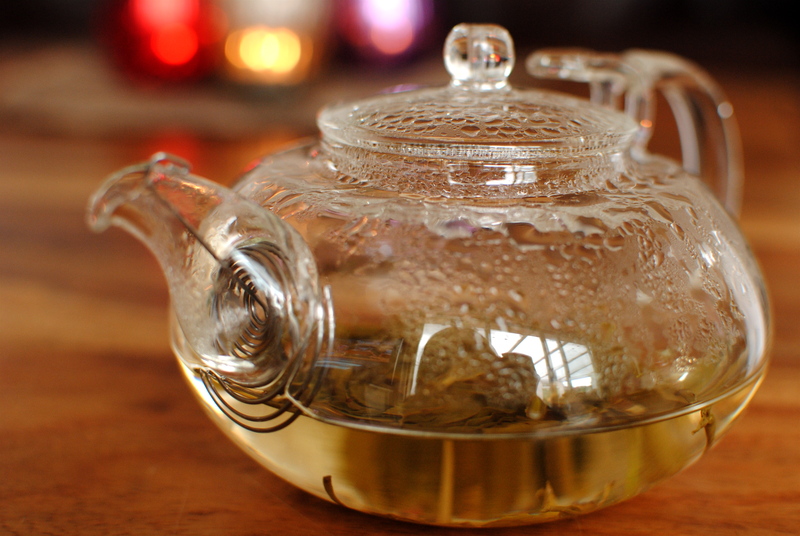 Recent purchase – dinky tea pot with spout-integrated spiral filter. Love it, but perhaps it’s too delicate and breakable for a notorious klutz such as myself. Time will tell. Thanks for developing a recipe to solve the granola dilemma. My daughter and I made granola and it was very much like dessert. I will share this with her and give it a try! You are most welcome Deb, and thanks for the lovely comment. Even some homemade recipes are more dessert than breakfast. Some may find this recipe a bit of a shock if they are used to overly sweet commercial ones but hopefully most will find it a good balance, or add a little more muscovado the next time. I hope your daughter likes it. Cheers, Deb :D. PS Are your tomatoes ripe yet? Yes, we finally have a few ripe tomatoes! But if I want to try canning some, I will have purchase them! Have you tried canning before? Still not sure how we missed all the sun this summer. Love how you start this post! Thank you Melissa. I had hoped I didn’t offend anyone with my slating of commercial granolas. At least you aren’t offended! Let me know if you make it. It is so easy and keeps really well. My daughter gets on at me if we run out. And of course use any nuts, seed, dried fruit combo that suits you. I’m not keen on dried tropical fruits personally, but they would be nice with maple syrup and nutmeg as sweetener/spice. Randy and I love reading “food to glow”. We have prepared and enjoyed several of your receipes. As a breast cancer survivor, I especially appreciated the homemade deodrant article. As Uncle R would say, “you knocked the ball out of the ballpark” with this one. If you ever tour the US, we look forward to meeting up with you. Hi Jeanette! Thanks so much for your kind comments. Let me know what recipes you have made and how they turned out for you. We will be over to see R & R in October so hopefully you and Randy will be around to meet up. Miss R is looking forward to Tennessee cooking! I know that commercial granola is loaded with sugar and salt, so I am delighted to have found your blog and this recipe! It looks wonderful! Thank you Karen! I know, granola from the shop can be quite shocking when you look at the label. We eat it because it is supposed to be so good for us but UK and US palates demand a certain level of sugar and salt that nix any health benefit from the otherwise fabulous ingredients. Still, commercial ones do make good desserts! I will check you out – cute blog name. I love lovage AND lavender! I agree with you and don’t purchase store bought granola for the reasons you’ve stated. They contain far too much sugar and fat. Besides they are expensive too, and I can make my own far cheaper with fresh ingredients from the bulk bins. Love this recipe and great blog post! Sometimes I am tempted by the crazy exotic ingredients, but then I just look at the price tag and the label and shuffle over to the health food store for decent ingredients and make my own. Thanks for the kind comments. 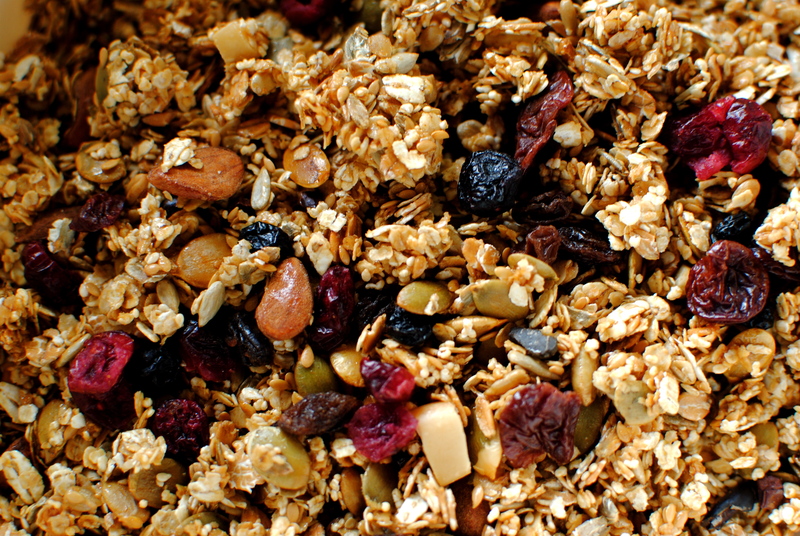 What things do you put in your granola? I will try to make my own granola I think. Thanks for the lovely recipe. Ok – so finally get round to making this in October 14 and don’t know what took me so long. We went with maple syrup, no added sugar and swapped hazelnuts for brazils (just personal preference). The results is very very tasty and perfectly sweet enough – I now can’t wait till breakfast tomorrow to tuck in with some natural yoghurt. And now I have all the ingredients in the house, there is no excuse for not replenishing granola supplies when they run out as it was so easy to put together . Thank you so much – will toast you at breakfast tomorrow! Ah thanks, Annie 🙂 You know, this is what I packed Rachel off to St Andrews with. She has been home twice, and I’ve had to replenish each time. This last batch included salted peanuts. Just sayin….